 No one understands unclaimed property reporting better than Keane. Whether your needs are to train your team on unclaimed property compliance or are looking for outsourced unclaimed property and escheatment services, our dedicated compliance team and our National Consulting & Advisory Services Group are uniquely positioned to assist companies as they navigate the path to compliance with state and federal regulations. Want to Get a Head Start on the 2019 Escheat Reporting Cycle? View our recent webinar on-demand to find out what you should already be doing to prepare. Keane acts as a true partner in addressing specific portions or the entire process of attaining unclaimed property compliance. In doing so, we help reduce compliance costs and turn compliance threats into business opportunities. We offer a full suite of unclaimed property services designed to help companies ensure full compliance with not only their respective state unclaimed property laws, but federal regulations such as Dodd-Frank and SEC 17Ad-17. States are becoming more consistent in their enforcement of compliance laws when it comes to unclaimed property and the escheatment process, viewing it as a valuable source of revenue. As a result, unclaimed property audits are more prevalent now than ever before. It’s imperative that companies conduct their unclaimed property reporting correctly and that they are in full compliance with all applicable regulations. Most state estimates suggest that only 15 to 35 percent of companies have fully achieved unclaimed property compliance, and even those who are in compliance technically may be under-reporting because they aren’t correctly interpreting what the state escheatment laws require. Those found to be out of compliance are subject to significant penalties – typically 12 percent of the underreported liability, including interest. Keane understands the ramifications of an unclaimed property audit – and the associated penalties that go along with one. We leverage the expertise and experience of our staff to ensure unclaimed property compliance moving forward. By taking responsibility and establishing a sound unclaimed property reporting process, your organization will be better able to ensure it is capable of reducing liability, meeting reporting deadlines, and remaining compliant throughout the year – which could save your company both resources and money in the long run.